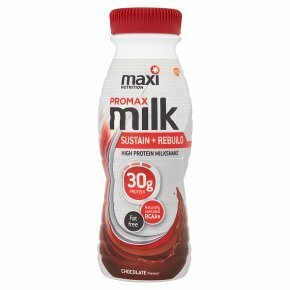 Why Promax Milk? Whatever your performance goal, do it with Promax Milk. Every bottle is formulated to deliver an effective 30g of protein, specifically designed to help your performance by maintaining and rebuilding muscle. Promax Milk is a great tasting and convenient way to help give your muscles what they need so you are ready to go again. It also provides a high-quality protein hit at anytime throughout the day to help meet your protein needs. Benefits of Promax Milk Screened and Effective Every batch of Promax Milk is screened for banned substances and is registered with the Informed-Sport programme. High in Protein Promax Milk delivers 30g of high-quality protein to help you maintain and rebuild muscle, so that you are always ready for your next performance. BCAAs Naturally containing the branched chain amino acids (BCAAs) leucine, isoleucine and valine, which can only be obtained in the diet. 30g protein. Naturally contains BCAAs. Fat free. Helps muscle rebuilding. Supports muscle development. Suitable for vegetarians. Why Promax Milk? Whatever your performance goal, do it with Promax Milk. Every bottle is formulated to deliver an effective 30g of protein, specifically designed to help your performance by maintaining and rebuilding muscle. Promax Milk is a great tasting and convenient way to help give your muscles what they need so you are ready to go again. It also provides a high-quality protein hit at anytime throughout the day to help meet your protein needs. Benefits of Promax Milk Screened and Effective Every batch of Promax Milk is screened for banned substances and is registered with the Informed-Sport programme. High in Protein Promax Milk delivers 30g of high-quality protein to help you maintain and rebuild muscle, so that you are always ready for your next performance. BCAAs Naturally containing the branched chain amino acids (BCAAs) leucine, isoleucine and valine, which can only be obtained in the diet. When & How to Use: Consume Promax Milk after exercise or as mid-morning or mid-afternoon protein packed snack. Shake well before use. Best served chilled.